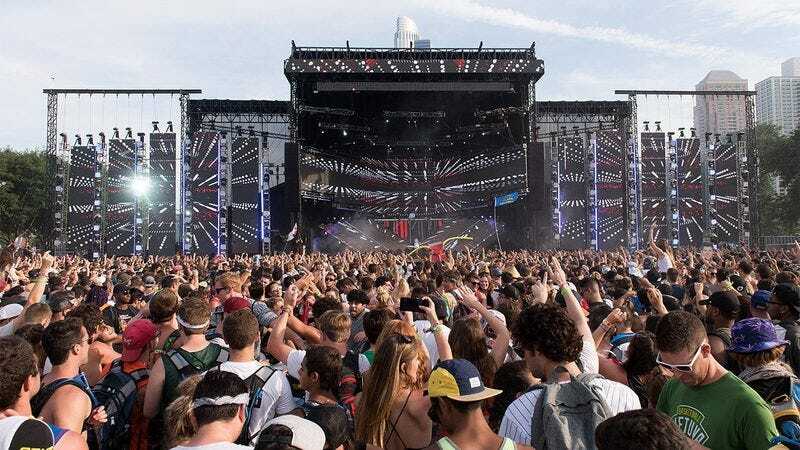 Over its 26-year history, Lollapalooza has transformed from a scrappy alternative touring festival into a colossal cultural and commercial event, attracting hundreds of thousands of attendees each year with lineups that include some of the biggest music acts on the planet. With the annual festival kicking off today in Chicago, here is everything you need to know about Lollapalooza to hold your own in conversation. Originally a showcase of an eclectic mix of music genres, Lollapalooza has gradually transformed into three days of LMFAO performing “Party Rock Anthem” louder and louder: The original Lollapalooza was made up of a variety of alternative music genres including industrial, punk, rap, and grunge, but over the years it has slowly morphed into the electronic dance act LMFAO repeatedly performing its hit single “Party Rock Anthem,” playing it slightly louder each time. The shift from the fest’s more noncommercial lineups to its current all-LMFAO incarnation happened so gradually over the years that fans of the festival were unable to notice the change. The festival boasts the highest concentration of 16-year-olds named Madison getting fingered while tripping on molly in all of North America: Similarly impressive, Lolla also has one of the Western hemisphere’s highest concentrations of guys named Tyler sporting neon promotional wayfarers and throwback NBA jerseys taking pulls of Burnett’s vodka from Gatorade bottles—second only to the Arizona State University campus. Both the Madisons and the Tylers can be spotted either writhing in front of the EDM stage or waiting outside the port-a-potties for their friend to vomit. The festival was moved to Chicago in an effort to lure the city’s mayor out of the tree he was hiding in: Originally a touring festival, Lollapalooza was reintroduced as a Chicago-based destination festival in 2005 as part of an effort to coax then-mayor Richard M. Daley out of a tree in Grant Park that he had crawled into several weeks earlier. Prior to the festival, they had tried to bait him down with tasty desserts and autographed baseball cards, but it wasn’t until they tempted him with a Primus set on Lolla’s opening day that he finally climbed down, unable to resist the urge to dance. The U.S. Fish and Wildlife Service has designated Lollapalooza a federally protected habitat for the Queens of the Stone Age: Thanks to conservation measures ensured by the Wilderness Act of 1964, the Lollapalooza grounds serve as a protected ecosystem for the five living members of Queens of the Stone Age, providing them safe refuge from destructive human and industrial activities. Implemented to help maintain the health and numbers of America’s Queens of the Stone Age population, the federal designation carries substantial monetary penalties or even jail time for any individuals who disturb, harass, or harm the band members within the festival boundaries. Every Lollapalooza ends with the ceremonial burning of a huge, screaming lollapalooza: You’ll know that this year’s Lollapalooza is coming to a close when the stagehands wheel out the sacrificial lollapalooza, tied to a crucifix made of kindling wood and crying out in fear. Festival tradition dictates that the crowd sings the lollapalooza’s shrill pleas for mercy back to it during the lighting of the pyre, and that its ashes are collected and scattered at the next Lollapalooza festival.